Chen’s salon fare is fine, but is Bruch the elephant in the room? A number of things about this ‘concept’ album irritated me: Ray Chen’s artistry is never in doubt, but I resent the notion that his importance as a serious artist should be even partially defined by the size of his YouTube following – or so we’re breathlessly informed. Second, just who the target of this CD is eludes me. Salon pieces by Kreisler and Cyril Scott were considered quaint in my youth, so heaven knows what millennials would make of them. The performances of Chen’s “own” Made in Berlin Quartet (all members of the Berlin Philharmonic) in Satie’s Gymnopédie, Clair de Lune and an arrangement of Waltzing Matilda (with a Dies Irae reference) are charming and musical, even witty, as are Scott’s Lotus Land, the Kreisler pieces – Syncopation and Schön Rosmarin – and the Heifetz arrangement of Ponce’s Estrellita, but the inclusion of Bruch’s warhorse violin concerto is bizarre. While Chen’s own rendition and the playing of the London Philharmonic under Robert Trevino are both fine, it makes for awkward listening. Surely it would have been more logical to devote the entire album to salon pieces? My other gripe is the title The Golden Age. It’s such a cliché. I don’t see our current time – with violinists like Mutter, Ehnes, Faust and Benedetti, to name but four – as being any less illustrious as that of Kreisler and the often-headlong Heifetz. 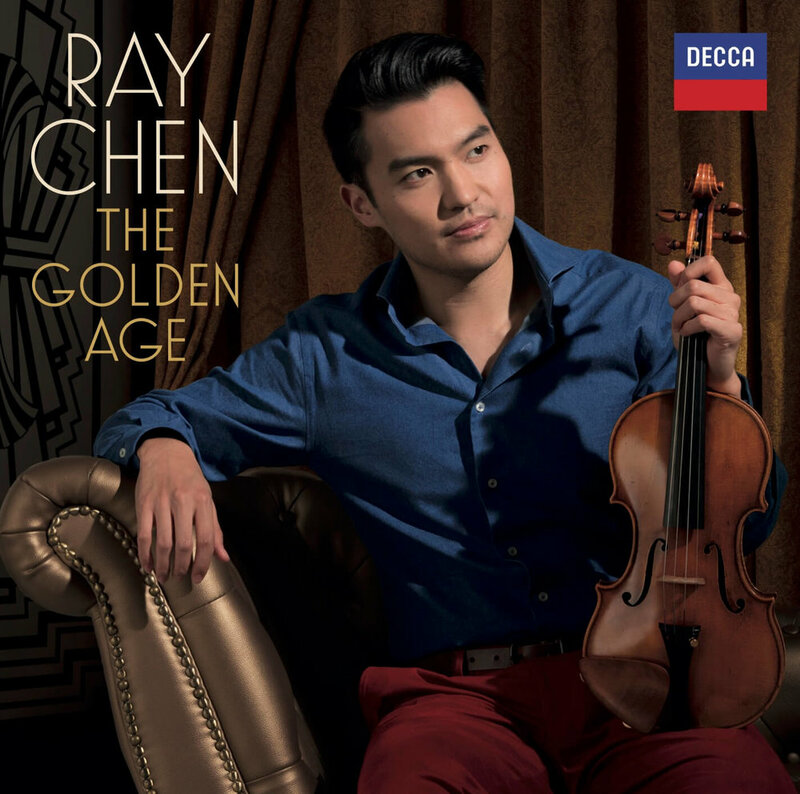 Ahead of his tour for Musica Viva, find out how you can win a copy of Ray Chen's The Golden Age through our Weekly Newsletter. Avi Avital, Ray Chen, Joyce Yang and András Schiff are all on the menu in next year’s season. The Taiwanese-Australian violinist, formerly part of Sony’s stable, celebrates a new contract with a comical video. New blood and big hitters like Vengerov will help Queensland Symphony Orchestra celebrate its 70th anniversary in 2017. He came, he saw, he exuded charisma and he conquered. The virtuoso fiddler has a fondness for Bilbo Baggins and reveals the time he fell off stage. Ray Chen wins hearts and minds with Shostakovich while Matheuz has a few idiosyncratic ideas on offer. This release can be placed without hesitation beside those of the other great Richard Strauss ensembles – the Royal Amsterdam Concertgebouw, The Dresden Staatskapelle and the Berlin Philharmonic. It was fascinating to hear the slightly kapellmeisterish Sawallisch in Also Sprach Zarathustra, the quintessentially bourgeois Strauss’s take on Nietzsche’s weird ruminations on the meaning of life. The result is outstanding, both interpretively and sonically, as Sawallisch completely avoids the blowzy schlockfest this work can become in the wrong hands. Nor does he attempt to achieve a more Hollywood effect by interfering with the duration of the opening chords. The Heldenleben is another superb achievement. This hero is less the armchair-bound Colonel Blimp of, say, Mariss Janssons – I always think Mahler nailed his carping critics far more effectively in the Rondo-Burleske movement of his Ninth Symphony than Strauss does. Sawallisch also resists the tendency to slow down unduly in the two quieter sections, which can turn them into a becalmed and interminable coda. Opting for the ending without horns also works better. The perspective and inner detail make this a demonstration-quality CD. Interview with 21-year-old Australian violinist Ray Chen who, this week, plays the Brahms Violin Concerto with the Sydney Symphony.